It is very important to buy the right sort of food containers for your Guinea Pigs. 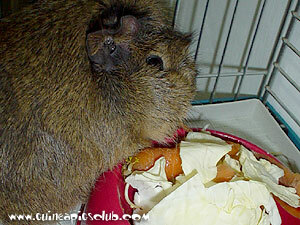 Food pots must be gnaw resistant and heavy enough not to be easily knocked over. 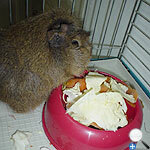 It's better if you also avoid to use plastic ones cause guinea pigs have the tendency to chew them. 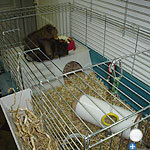 In the hutch/cage food hay should be placed in a hayrack attached to the cage. This will avoid trampling and soling of the hay. It is important to clean the food utensils two or three times a week. The best choice for water utensils is the gravity-feed demand-type water bottle. They have a ball-valve in its metal spout and clips on the cage side. At pet shops you can find various designs. 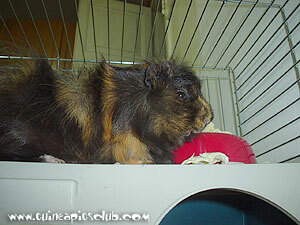 When installing make sure that your guinea pig can reach the spout. Shallow bowls and pots, are not good as water containers. They become quickly contaminated with bedding, droppings and food. It is important to clean the water utensils two or three times a week. 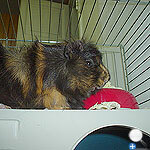 Guinea Pigs need exercise and periods of freedom are very important for them. They will also benefit by having some chunk, twig or softwood to nibble. Four-inch diameter PVC pipes are also a big hit for them as they can play and make exercise in them. 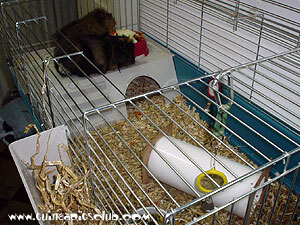 For my Guinea Pigs I installed 2 pieces of wood at each end of the PVC pipe so they don't nibble the PVC and also this way the pipe will not move when they go in it.